The Resurrection of Christ gives us strength in time of weakness and allows us to feel the Divine power, which is with us and is greater than the power of evil, upon which those who persecute us and fight against us depend on. 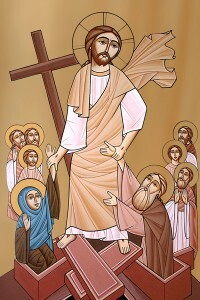 It is my pleasure to wish all of you a Glorious Feast of the Resurrection of our Lord, God, and Savior Jesus. The Resurrection of Christ gives us strength in time of weakness and allows us to feel the Divine power, which is with us and is greater than the power of evil, upon which those who persecute us and fight against us depend on. Fear penetrates into our hearts when we see the power of evil fighting against us, and we don’t see the Divine power supporting and surrounding us. It is the power of the Resurrection that enlightened the minds of the two disciples of Emmaus, opening their eyes making them recognize Christ. Consequently, their fear and despair were turned to joy, power, and motivation to return to Jerusalem to inform the rest of the disciples. It is the power of the Resurrection, which changed the disciples’ sadness to joy. They were changed from a frightened, weak, and terrified group to a strong group calling on the whole world to believe in Christ. They were able to face the evil powers with courage and evangelize openly without fear or hesitation. It is the power of the Resurrection that opened the eyes of Elisha’s servant to see the Divine power surrounding his master, and therefore the army and chariots of the King of Aram became small in his eyes. During this feast, we bid farewell to our beloved martyrs of El-Khosous and the Cathedral. During this feast, we painfully remember the criminal aggression against St. Mark Cathedral in Cairo. During this feast, we remember the suffering of our beloved brothers and sisters in Egypt from persecutions and aggression against the sacred places, as well as the kidnapping of girls and the attacks by the trumpets of fanaticism. 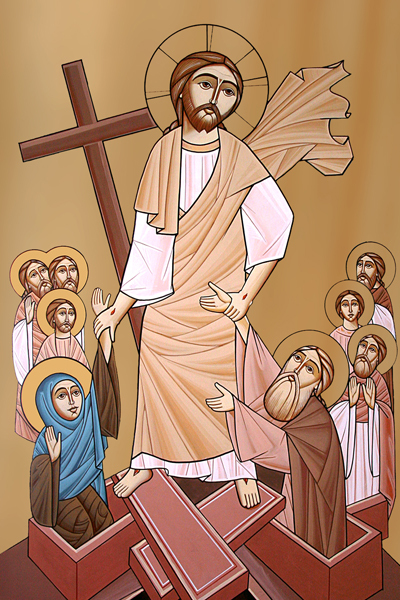 We pray that our Living Christ may grant us always opened eyes, enlightened by the light of His glorious Resurrection, so we may always see that those, who are with us, are more than those, who are with them. We pray for the peace of the Holy Church and for our beloved father, His Holiness Pope Tawadros II. We pray for the repose of the souls of our beloved martyrs and for the comfort of their families, as well as for the speedy recovery of the injured ones. We pray that peace may prevail throughout the whole world.